The Universal Power chair and Scooter Lift offers superior flexibility and versatility at an extremely affordable price. Easy operation and superior construction ensure years of trouble-free use. This carrier is made from a combination of high-strength aluminum and durable powder-coated steel for years of use and dependability. 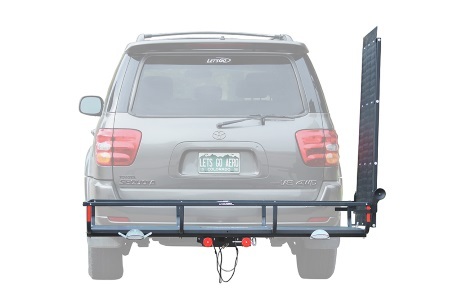 This lift includes numerous accessories not found elsewhere - 4 retractable straps to secure you chair to the carrier, manual back-up hand crank, a license plate holder, wiring harness, and a hitch adapter for Class II hitches. 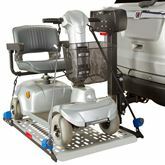 The Universal Electric Power Chair and Scooter Lift and Carrier is designed for use with all types of power chair and scooter wheelbases measuring up to 42" long x 27" wide and weighing up to 350 lbs. Installation is a breeze and requires no drilling or modifications to your vehicle. Featuring a folding design, this lift easily stows vertically after use, saving space while improving visibility. 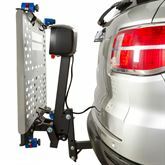 The power chair lift and carrier is compatible with any vehicle equipped with a Class II, III, or IV hitch. Manufactured from high-strength, lightweight aluminum & Weighs 82 lbs. Platform measures 39" L x 27" W with an adjustable cradle that extends to 46"
Transports Wheelchairs, Scooters, Equipment, Cargo, just about anything? Usable Platform Area of 28" x 47"
Usable Platform Area of 28" x 48 1/4"
Usable Platform Area of 29 1/2" x 48 1/4"
Swings the SC500 carrier completely out of the way for full access to rear of vehicle. 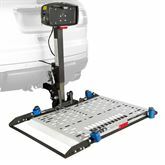 Built in adapter allows for up to 7" of rise for vehicles with low hitch heightsTransports Wheelchairs, Scooters, Equipment, Cargo, just about anything! 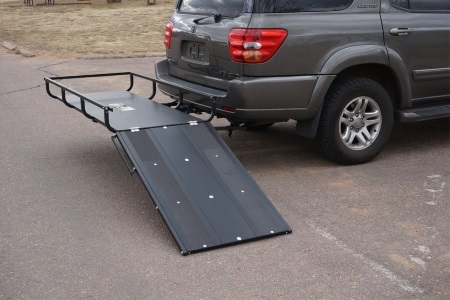 4 foot long by 32" wide slide-out cargo rack with folding ramp for loading mobility scooters, wheel chairs, snow blowers, generators, and other heavy wheeled products. 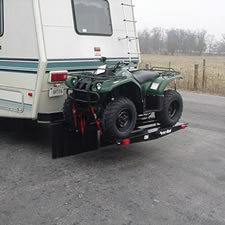 6 f0tt long by 32" wide slide-out cargo rack with folding ramp for loading mobility scooters, wheel chairs, snow blowers, generators, and other heavy wheeled products. Usable Platform Area of 27 3/4" x 47 3/4" & Weighs 115 lbs. 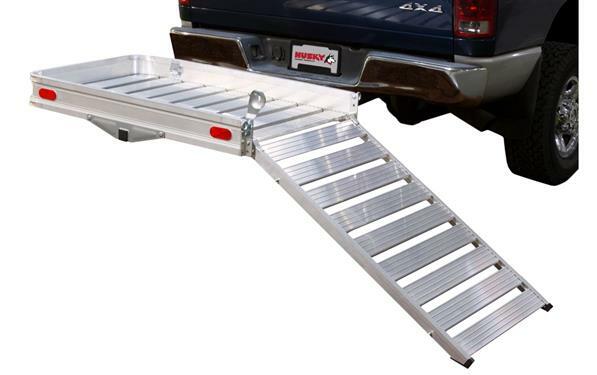 Ramp Folds Down and Is 60"
Usable Platform Area of 32 3/4" x 58 3/4"
Holds Up To 700 lbs. 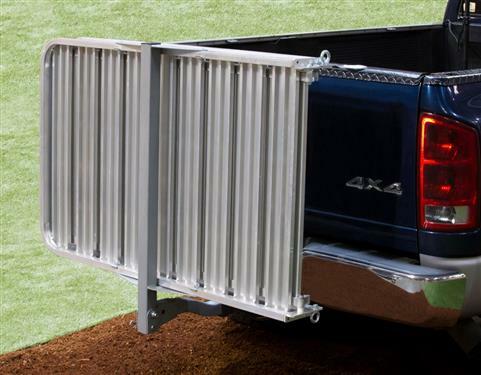 The distance between the rails and bumper are adjustable. Length Of Rail - 71 1/2"
Rail Width - 9 1/4"